Last year we wrote about a significant difference in a sequence of Bob De Moor‘s Snoe & Snolleke album “Het Mollenrijk” as published in the Flemish newspaper Het Nieuws van de Dag and the version of the albums as published by Bédéscope. The two versions were finally included in one edition, that by Brabant Strip in 2003 (a highly recommended version). 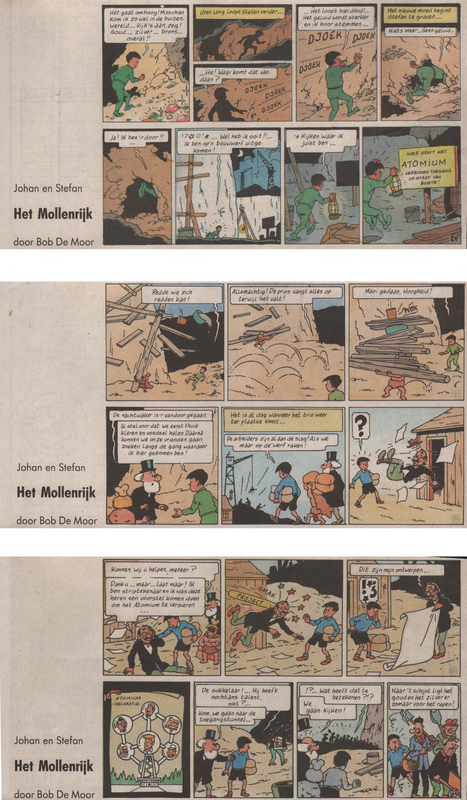 3 strips in colour from the version as published by Gazet van Antwerpen in 1992. But there’s actually another (4th) version – which never has been put in album format – and that’s a coloured upgraded version which was published in the Flemish newspaper Gazet van Antwerpen from February 5 1992 until May 16 1992 as a 2 strip comic. There are more albums like this one which saw a coloured publication in Gazet Van Antwerpen with altered texts (but without redrawn parts) and which never were published in album format afterwards. The albums involved include: “De Gele Spion” (there was only a French version of this coloured album published in a Boogaloo edition), “De Blauwe Vinger”, “De Spaa-Motor” and “De with Mau-Mau” which mid-through was published in one strip and not as a double strip as was the case with all other coloured reprisals in the newspaper Gazet van Antwerpen. The reason for these stories to be published like this might be pretty simple. Keep in mind that by then Bob De Moor was already seriously ill and it would have been impossible for him to oversee the preparation for the coloured re-publications since numerous alterations had to be done to the material. Most probably that is the reason why these 5 albums never saw a release in colour via Rijperman, Casterman or Standaard Uitgeverij. We will update this story as we have requested some details from Johan De Moor.